by Molly Bradley, Guest Blogger The more we have in our lives, the more there is that we can’t live without. That’s not a sweeping philosophical statement. I mean it literally: If we don’t bring practically everything we own when we leave the house, we’re afraid we’ll find ourselves stranded, desperate for that one thing we left behind: a full makeup kit, a change of shoes, yoga clothes and running apparel, the laptop with every bit of work we’ve done in the last five years accessible at a moment’s notice. Without these things, we feel insecure. 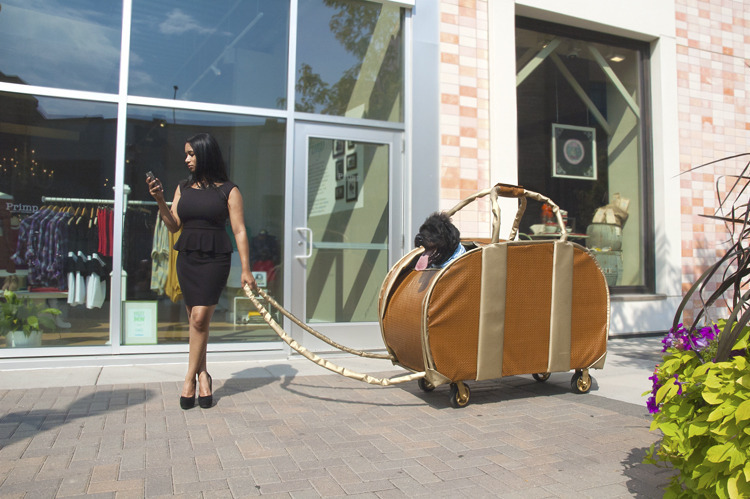 To resolve this quandary, we’ve embraced the oversized handbag. The name is a misnomer: We can barely lift one of these bags with a single hand. A fully-loaded bag is a full-body endeavor. In a city, where you can’t toss it in your car, you’re marooned with your burden. In the suburbs, it’s a little easier: your car itself becomes your handbag, and you suffer less for even more stuff. Despite the pain of lugging such loads for blocks upon blocks, women balk at the prospect of bagging their bags. Here is where we need to stop and reflect. 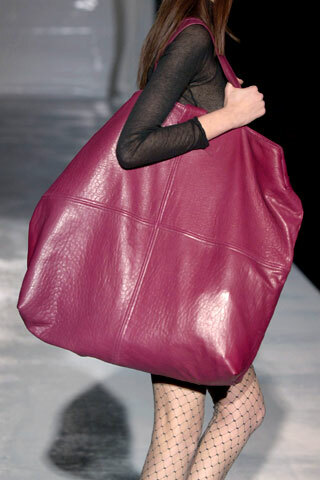 Why are we so attached to our gargantuan bags? Is it simply because they allow us to tote a week’s worth of gear? Or because a huge bag makes us look tiny and cute, like a clever Alice who’s swallowed the perfect poison to make her petite? Is it an overstatement of feminist independence: that not only do we not need anyone’s money, but we don’t need anything from anyone at all, given that we now carry the contents of a fully-stocked studio apartment with us at all times? Fashion functions according to its own set of rules – one of which rules that fashion should not necessarily be functional. It's the reason we stand tall on high heels despite the overwhelming evidence that those stylish stilettos will one day bring us crashing down. It's the reason that last winter I overheard a woman on the ski slope, when asked why she had not worn her goggles instead of her sunglasses that day when they knew there was going to be a snowstorm, say, "But they didn't go with my cape." Big bags initially belonged exclusively to working men, in the form of briefcases, while women carried only small pouches, purses and wristlets. Around the 1930s, the shoulder bag and the satchel came into being around the same time as the clutch, which was a slightly larger version of the preexisting “pochette.” In the 1940s, as more women entered the workplace, bags became more appropriate for women, and grew larger overall. Though small bags were still symbols of femininity well through the 1960s, as travel became more popular in the seventies, larger bags became not only acceptable but fashionable. Tiny, barely-there bags were still uniquely feminine and fashion-forward, though, because for a long time lugging remained a lower-class act. Small purses were once the hallmarks of the dainty and ladylike, and anything larger was loaded onto the porter. But ladies whose primary characteristic is “dainty” don’t tend to make history or headlines these days. Now, being able to lug your stuff signals independence. We laud women who work hard, accomplish a lot, and do it all themselves. If being that woman means having our hands full at all times (or just looking like it), so be it. Hence the beasts of burden on our shoulders that look like they have lives of their own. When a woman walks in equipped to perform any task you could ask, who’s going to glance at the girl twirling a wristlet that can only carry a phone, a key, and some cash? It seems that around 2006, the world woke up to this backtastrophe. The New York Times came out with several articles and blogs about the hazards of big bags. Oprah’s magazine O ran a piece called “Shop Smart: Is Your Handbag Killing You?” and a guide on finding a handbag that won’t hurt your back. "They may not be practical," says Sasha Charnin Morrison, fashion director of US Weekly, "but so what? When it comes to fashion, being practical is a huge bore." The thing is, these bags are practical in terms of our lifestyles. But in terms of our bodies, they’re dangerous. I used to make a point of buying handbags that would fit at least one notebook and one book in addition to the necessities of wallet, phone, and keys. In the past couple years, that requirement has been bumped up to two books plus several notebooks. Lately, I won't settle for something that I couldn't sling my laptop in if I had to. 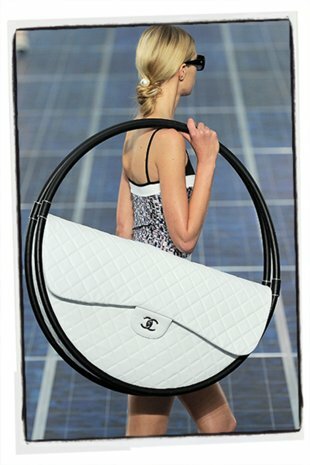 Proof that we’re big-bag-batty: This hula-hoop bag by Chanel gained unexpected popularity on Twitter and Instagram, leading major French department store Printemps to purchase some to sell in spring 2014. The first issue is the weight alone. Dr Pierre D’Hemecourt, a sports medicine specialist at the Boston Children’s Hospital, says that stress fractures, inflammation of cartilage, back and neck strain, and nerve damage in the neck and shoulders are all likely results of a too-heavy bag – even if it’s a backpack. His research in the area has focused on the weight children carry to and from school every day, but adults run the same risks. “When you carry something heavy every day, the accumulated stress can lead to significant injuries that require medical attention,” says Martin Lanoff, MD, physical medicine and rehabilitation specialist and clinical assistant professor at Chicago’s Rosalind Franklin University Medical School. A study in London investigates how bags of various shapes and weights affect stride. becomes tense, in order to keep it from sliding down your arm and dismembering you at the elbow. “If you can think about the way you carry a bag, it’s usually on one side and you kind of pull your neck to one side,” explains Sadler. “It’s a very unnatural position.” What’s more, you probably have a preferred side to carry on, and you don’t switch – so you’re doing particular damage to one side. All of the above can further lead to pain in your low back, buttock and thigh. Compress the vertebrae enough and you can engender an ugly case of sciatica, where the spinal nerve roots are squeezed unmercifully, causing searing pain all the way down your leg to your foot. Because the load causes you to walk differently, it changes the way force acts on the skeletal system at large. This means more pressure on the hip and knee joints. Before you leave the house in the morning, ask yourself what you really need. Can some items, like a spare pair of shoes or a makeup kit, be stowed permanently at the office? Do you really need to carry the huge power cord and transformer for your computer everywhere you go, or could you use a lighter and more portable spare? Are you sure you’re going to stop what you’re doing to use that hair straightener in the middle of your day? - Try to get over your allergy to looking like a kindergartner or a Girl Scout, and switch to a backpack. There are some fashionable ones out there. Balancing the load across two shoulders will help. Check Garnet Hill online for an excellent-looking but lightweight leather backpack, like the Celia Leather Backpack. - Straps are key: look for wide straps, ideally with padding. Seek straps long enough to sling the bag cross-body to spread the weight out, but short enough that the bag does not swing and bump into your hips or the backs of your legs as you walk. Adjust the bag so that its weight falls in the stomach/pelvis region. - Here comes the hard part: the weight of a hand-/shoulder-/laptop bag should not be more than 10% of your body weight. - Choose a handbag's size relative to your body size, and not anyone else's, to help you avoid overloading but also to avoid looking ridiculous. A Stella McCartney Falabella might look good on a statuesque silhouette, but if you're just cresting five feet, it’s not for you. - Consider the weight of the bag itself before you put anything into it. Select bags made of lightweight materials, like vinyl or canvas, rather than thick, weighty leather. If you must have a leather bag, don't choose one with unnecessary and nonfunctional weight, like a half-pound padlock. That’s just asking for it. - When carrying a shoulder bag, switch sides at regular intervals. It will relieve the muscles of your shoulders and arms, and at least any damage will be symmetrical. Through the eight years of high school and college, I carried textbook-stuffed totes on my left shoulder. Now I feel uncomfortable carrying anything on my other side, which is bound to be trouble in the long run. As a matter of fact, I just realized I’m so off-kilter I’m looking at the screen sideways as I type. Does Flying Have to Hurt?